How do I keep cookies from burning on the bottom? Every time I make cookies they burn on the bottom. Is there a way to prevent this? I would first get a thermometer that you can keep in your oven so that you can measure the temperature accurately. Home ovens are notoriously inaccurate. 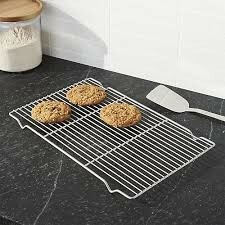 Secondly, I would try to use a good quality baking sheet. One that has some heft to it, as it will better conduct the heat. Finally, I would bake the cookies at 350 F.
It's always helpful when cooking to think about the different ways that the heat is being transferred to your food. In the case of baking we have (primarily) conducted heat from the pan to the bottom of your cookies, convection taking place from the hot air circulating to the top of your cookies, and radiative heat from the heating element in the oven. It's more than likely the heating element in your oven is on the bottom, which is causing the pan to transfer the heat to the pan faster than ideal, causing the bottoms to burn. One way to mitigate this is to adjust the distance between the heating elements and the pan by moving it to a higher rack or adjusting the rack height. If, on the highest rack, you're still getting burnt bottoms, you might try putting an empty sheet pan, casserole dish, pizza stone, etc. to try and block some of that direct heat. Alternatively, you might also try, as moscafj suggests, bumping the temp down to 350F. Depending on how well-done you like your cookies, you might have to extend the baking time a minute or two to compensate. Why is my first batch of cookies out of the oven too flat? How do I make oatmeal chocolate chip cookies that are thick? How to Bake Cookies Without a Convection Oven?